FAFSA is the king of the financial aid forms. It stands for Free Application for Federal Student Aid. Your FASFA will be used by the federal government to calculate your EFC (Expected Family Contribution), which will then be forwarded on to the schools you are considering. The financial aid packages offered by those schools are based off of this information. The FASFA becomes available at www.fafsa.gov on January 1st of the student’s senior year in high school. You are required to re-submit a new FAFSA every year if you want to apply for financial aid for the next school year. Q: Do I have to complete FAFSA every year? Yes — if you want financial aid. A separate FAFSA form is required for each student every year that you wish to apply for financial aid. The FAFSA can be completed online for FREE at www.fafsa.gov. Make sure you DO NOT go to fafsa.com or fafsa.org. Q: Do I have to file my taxes before filling out the FAFSA? No. While the FAFSA requests a lot of tax information, you can and should complete and submit the FAFSA based on estimated tax and income information. You can go back and update your tax information once your taxes are done. Financial aid is distributed on a first come-first served basis so you should apply as early as possible, which most likely means your tax information will be based on estimates. EFC is an acronym for your Expected Family Contribution. This is the amount that the federal government thinks you can afford to pay for college for the next year. You should expect this number to be higher than what you think you can afford. It is important to plan ahead to lower your EFC as much as possible prior to completing the FASFA so that you can qualify for more in grants, scholarships and financial aid. Q: How do I calculate my EFC? The federal government will calculate this number for you. We can also calculate your EFC as a part of the full report that is included with our services. This report will give you a good idea about your current EFC, as well as all of the things you can do in the planning process to reduce your EFC as much as possible. The federal government will be looking at your entire household financial situation when calculating your EFC. Q: Should my student apply for private scholarships? Yes. You should always make an effort to get private scholarships, which are a vital and often-overlooked financial resource. While much is heard about those mythical full-ride scholarships, there is a lot of financial aid money out there — and scholarships only account for about 3% of all financial aid. Parents, that means 97% of all financial aid is NOT in the form of scholarships. NEVER make your student’s college education contingent upon receiving a scholarship. Having said that, it is easier than ever to search for scholarships today. You will find great scholarship search engines at www.fastweb.com and www.nextstudent.com. Q: How long before a student can receive in-state tuition rates at a state school? The requirements are different for every school. You will have to check with the school’s financial aid office to determine their own residency requirements to receive in-state tuition rates. Q: Can I increase my 401k or IRA contributions to offset income and qualify for more financial aid? No. FAFSA income will consider gross income for that year. Any deferred income for that year will be added back in to determine your gross income. Q: What is the maximum income we can make before we become ineligible for financial aid? There is no maximum income. All that matters is your EFC, and your EFC will be calculated on more factors than just income. If your EFC is less than the cost of attendance at the school you are considering, then you qualify for financial aid. If it isn’t, you will not receive any financial aid in all likelihood. It’s crucial to do all that you can to reduce your EFC as much as possible before applying for financial aid. Q: Is financial aid offered only as a loan? No. Financial aid consists of grants, scholarships, loans and work-study. Financial aid award packages are put together by the schools you are considering, and you will likely receive different financial aid award packages at each school. Schools are not equal when it comes to funding. Some schools have a lot of money and other schools have very little. This means that the financial aid you are offered will vary both in amount and type from one school to the next. It is important to consider schools you know will be able to do a better job of helping you pay for your student’s college education. Q: When should we start planning? Now! As is usually the case when it comes to financial planning, the best time to start was several years ago — and the next best time is right now. The more time you have to plan for college expenses, the easier it will be on you. Ideally, we’d love to start the college planning process before your student even enters high school. The reality, however, is that most families aren’t thinking about college that early. To get the best results, you should at least start the college planning process early in the student’s junior year. Q: I’m divorced. Which parent’s information do we use to file the FAFSA? The household that the student lived in for more than 50% of the time during that student’s base year should be used for filing the FAFSA. (The base year is the tax year prior to completing the FAFSA.) If the student spent equal time in both households, the next determining factor is provided support — you must use the information of the parent who provided more support when filing the FASFA. To ensure you are reporting this situation properly, call our office to speak with a college planning specialist. Q: My child is turning 18 next month; can they now file as an independent student? No. There are very specific circumstances that allow a student to qualify as independent for financial aid. The big three are: 1. be a veteran of the armed services, 2. have a child, and 3. be married. There are a few other (uncommon) circumstances for which the student may qualify, but in almost all other cases, your student is dependent for financial aid purposes until age 24. Q: Does my 401k, 403b, 457, IRA or 529 count as an asset for FAFSA? As of now, retirement plan assets are not listed on the FAFSA. While they are listed on the profile form, very few schools currently assess these assets. 529 plan accounts where the student is the beneficiary and a parent is the owner are assessed as an asset to the parent. This is much better than owning assets in the student’s name. Q: How does the HEFAR group make money? 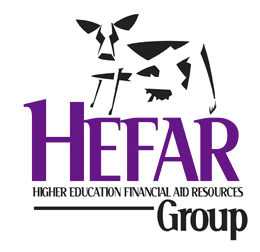 The HEFAR Group is a non-profit company, meaning that our college planning service is FREE! To get an idea of how we make money, you have to remember that we are a division of a larger company that offers a number of financial services, such as mortgages, retirement planning, investments, insurance, etc. Many of the parents who use The HEFAR Group for our college planning service become familiar with our advisors, grow to like us as a company, and end up taking advantage of the other services we offer. It’s that simple. There are no hidden costs or bait and switch. We simply provide quality services, and many families switch to us after the experience.